Since it bugged me that I didn't fit in a Dragoon in there, I went and whipped one up. Repurposed an old Fetterlock armor design and gave it to a (reasonably) nice fellow I hadn't drawn in a while. This is Sabras Savrhein, one of the Nine Banner Captains and a veteran of the Imperial Civil War--"Crimwar 6" to the cheeky. I'd never actually defined which Banner Sabras led. Or if I did I lost my notes. All I remember is that Aumetz was Captain of the First Banner whilst Dante was Captain of the last. Maybe Sabras was the 4th Captain. 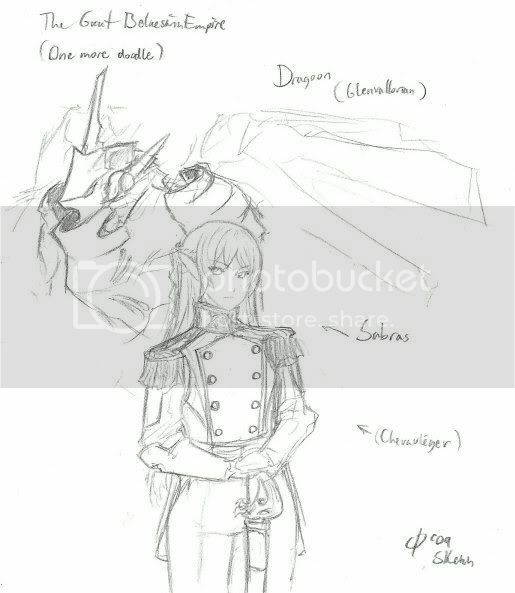 Anywho, his Dragoon officer uniform, while a bit sparse on the decorations, was inspired by the sort of uniform worn by light cavalry. Or would it be better to call them Knights Banneret? Perhaps that term is more appropriate to their adjutants or the company-level officers ranking below them. And I don't think the Banners are Knightly Orders, secular or otherwise. However, they did have to be a considerably well-trained and professional fighting force in order to stand up to the Imperial Protectorate Faction. They were backed by the Grand Celestial Republic and most of their personnel were drawn Belnesarian Imperial Army; few would confuse them for simple rebels or a mere citizen militia. I sent new pictures of Teagan to your email. I don't have a lot of time to talk today, so that's it. Hope everything is going well for you. I ought to check my mail then.